In a saltwater aquarium, the only healthy amount of ammonia is none. If you can detect ammonia in your aquarium, the levels are too high for marine organisms. In order to care for a saltwater aquarium, understanding what ammonia is and how to control it is paramount. 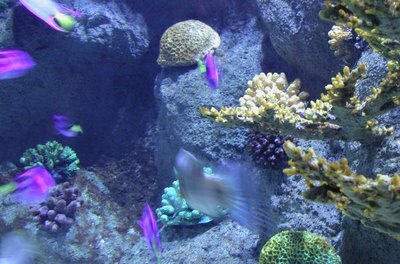 Ammonia can get into a marine aquarium in several ways. The main source of ammonia in a saltwater aquarium is its inhabitants' waste. All animals produce ammonia as a byproduct of their metabolism. Additionally, rotting biological material, like dead fish and algae also releases ammonia through the process of decay. Similarly, uneaten, rotting fish food can produce ammonia. 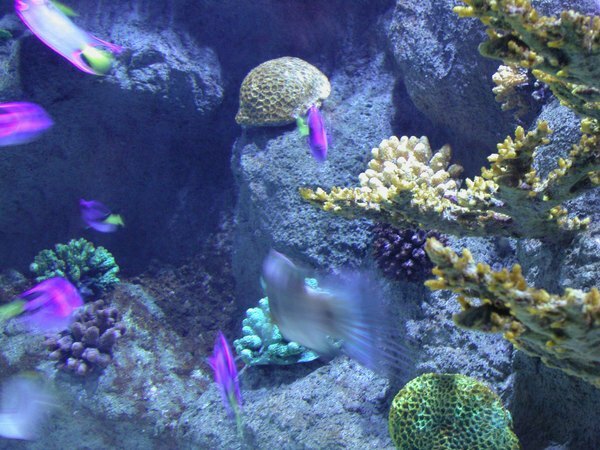 Theoretically, ammonia can get into an aquarium from tap water, so most saltwater hobbyists use purified reverse osmosis water to eliminate this risk. Ammonia has several effects on living things. The compound is toxic and acts as an irritant. In fish, and invertebrates with developed gills, ammonia damages the gills first. It can cause bleeding on gills and the surface of the skin. The damage to the gills actually makes it harder for the fish to get rid of the ammonia they produce, resulting in a toxic buildup of the compound within their bodies. In invertebrates without gills, ammonia can burn their skin. Because of this, ammonia is toxic to all animals in saltwater aquariums. Organisms exposed to ammonia will show several symptoms. It will be most obvious in fish. Fish will breathe more quickly; you will seem them flap their gills more rapidly than normal. Fish may also gasp at the surface of the water. In mild cases, fish may become lethargic and hid in the recesses of an aquarium. Invertebrates may shrink back, retracting tentacles. Invertebrates become less responsive in the presence of ammonia. The biggest sign of ammonia poisoning is mass die-off of animals in the tank. In a healthy aquarium, a process called the nitrogen cycle breaks down ammonia into less toxic nitrogen compounds. The process of establishing healthy colonies in an aquarium is called cycling. However, cycling works only if you're patient in introducing organism into the aquarium. If you have an acute rise in ammonia, your best options are to temporarily cut off feeding and perform a 50 percent water change to dilute the ammonia. You should test weekly for ammonia in a new saltwater tank or monthly in a fully cycled tank.